The map adds detailed Walkability information for 660 crossings of 193 intersections. This unprecedented interactive map allows pedestrians to identify safe routes and identifies and prioritizes needed infrastructure improvements. Volunteers captured 19 data elements for each crossing and photographed missing elements as evidence. We then assigned a Walkability score to each intersection, which we used to prioritize improvements. Finally, we advocated for improvements by presenting our findings to the Township. 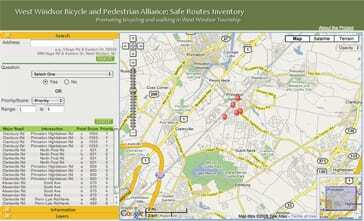 In May 2009, WWBPA helped with Walkability assessments for Plainsboro and Hightstown. Our public participation Bikeability map is also available online. In addition to finding bikeable roads, users can add information to the map about collisions, near misses and even bikepooling. The hard copy bilingual bicycle/pedestrian map is available at the West Windsor Farmers’ Market, Saturdays, 9 a.m. to 1 p.m., from May through the end of October. It is free to members and available to the public with a $5 donation. Click for Mercer County Park trail map.